Without doubt, Cappadocia is one of the most characteristic regions in the world due to its geography featuring rock-cut settlements, fairy chimneys, and colorful valleys. This characteristics of Cappadocia make outdoor activities in the region very special. If you are willing a real mountain bike ride in the magical valleys of Cappadocia, Istanbul Tour Studio’s Cappadocia Mountain Bike Tour fits perfectly for you. 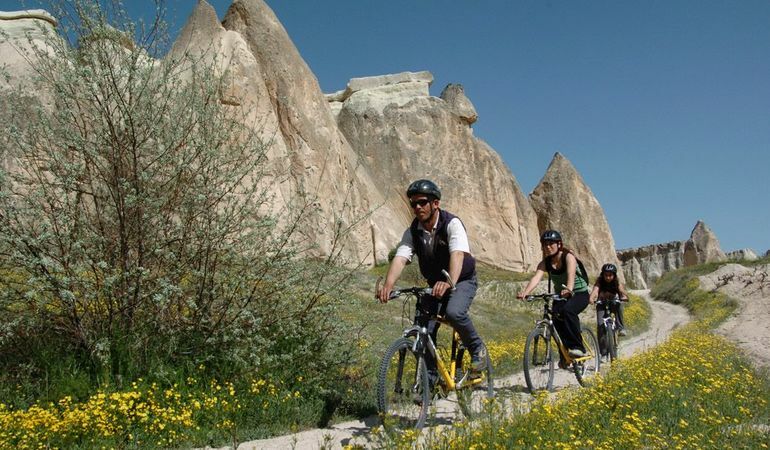 In scope of Cappadocia Mountain Bike Tour, we will head out through the fairy chimney valley of Dereyamanli. A small track will lead us to Cavusin with its amazing rock cliff and on to the Pasabag valley whose fairy chimneys have multiple “hats”. At the end of the tour, we will go back to Avanos through the village of Yeni Zelve, which features amazing landscapes. 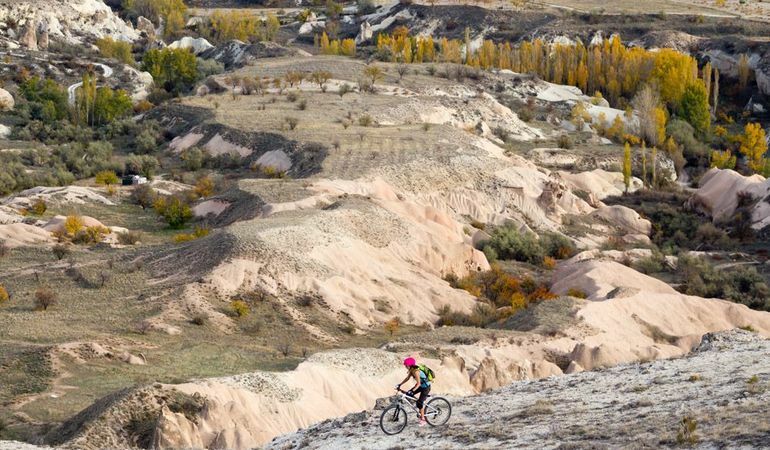 Mountain bike on the magical valleys of Cappadocia: Riding a mountain bike in the magical valleys of Cappadocia such as Kiliclar Valley, Pasabag Valley, and Zelve will be an unforgettable experience for you. Get ready to getting dirty: At the end of the tour you might get dirty and dusty. 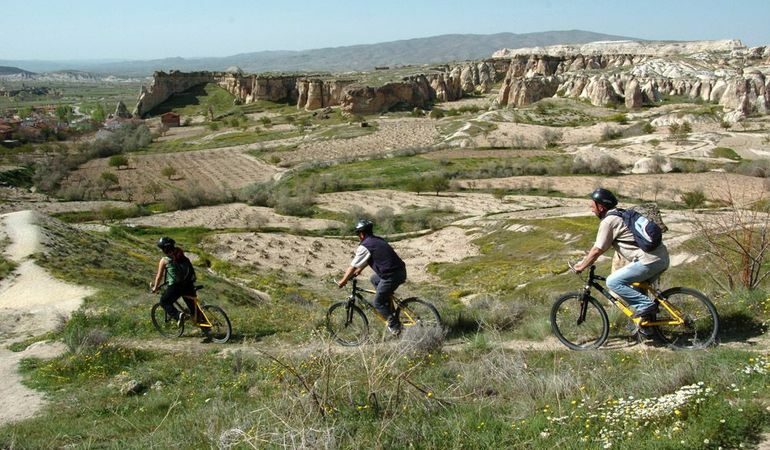 Therefore, we recommend you not to wear your best clothes for Cappadocia Mountain Bike Tour. Safe and professional outdoor activities company: We have been working with a very professional outdoor-activities company operating in Cappadocia since 1985 and they are the pioneers of outdoor activities in the region. Anyone who likes outdoor activities, mountain bike, and amazing landscapes. Visitors to Cappadocia that want to get the most out of their trip. Why book with Istanbul Tour Studio? We put safety first and use the most professional and reputable outdoor activities company around. We can also help you plan the rest of your trip with our expert guides. We’re rated ‘Excellent’ on Tripadvisor. Click here to find out why. If you are willing a real mountain bike ride in the magical valleys of Cappadocia, Istanbul Tour Studio’s Cappadocia Mountain Bike Tour fits perfectly for you.